Fraud poses a major threat to the UK. It’s a crime that the finance industry is committed to tackling, but it’s also one that requires the combined efforts of every sector, both public and private, to overcome. 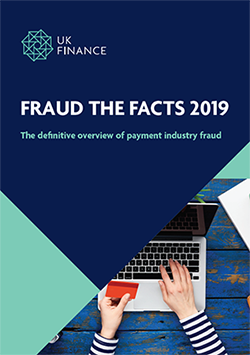 Our Fraud the Facts 2019 report lays bare the extent of the challenge. Last year the advanced security systems and innovations in which the finance industry invests to protect customers stopped more than £1.6 billion of unauthorised fraud. But despite this, criminals successfully stole £1.2 billion through fraud and scams in 2018. These crimes can have a devastating impact on victims. And even if the customer gets the money back from their finance provider, the organised criminal gangs which perpetrate these frauds still profit from the proceeds. Money that may go on to fund illicit acts which damage our society – crimes such as terrorism, drug trafficking and people smuggling. Following on from the huge success of the inaugural Economic Crime Congress last year, UK Finance is delighted to announce that this year’s event will take place on Tuesday 10 December 2019 in central London. Last years event attracted over 450 attendees with an opening keynote from the current Home Secretary, Sajid Javid. The event provided the opportunity to engage in high-level debate, networking and the chance to explore cross-sector collaboration. Content covered throughout the day included Anti-Money Laundering, Fraud Prevention, Financial Sanctions and Bribery and Corruption. Further details and booking will be available in May, but please save the date in your diary and pass on to colleagues you also feel would benefit from attending.